CROWS are amongst the most intelligent of birds. They belong to the Corvus family of which there are over forty species worldwide. Of these, seven can be seen in County Kerry and all over Ireland - theraven, rook, jackdaw, hooded crow, magpie, chough and jay. The birds that most of us know as ‘crows’ are rooks. Our other common crows are the jackdaws, smaller than rooks with a grey sheen on their heads and a self-confident swagger. Then there are the hooded crows (also known as grey or scald crows) which, with their distinctive black and grey colouring, are easy to spot. Choughs are very uncommon crows, but very easy to recognise. They live along the north, west and south coasts and have bright red bills and legs. The unpopular magpies are brilliantly coloured, and omnipresent. Cheeky and vicious, they contrast with the shy Jay, which is a woodland bird having an elegant brown/pink colour with beautiful blue wing stripes displayed in flight. The following is an old folktale about crows: There was an old crow long ago, and he made a nest. After a time all the young ones fledged, except one, who remained with him. One day, the old crow took the young one out into the field to teach him how to fly. When the young crow had learned to fly and was able to travel far, the old crow said: “I think you are able to fly anywhere now and make your living by yourself. Before you go, I want to give you a little advice that will protect you from danger, as it has protected me. The Rook (Corvus frugilegus frugilegus). In Irish Rucach is the second largest crow and is one of Ireland’s best known birds. Highly intelligent, they live in communities called rookeries. Every evening I see them congregate in their thousands as darkness approaches. They rest and chatter on the wires and rocks before flying across Leap estuary to roost in the trees in Myross Wood. Accompanied by their cousins, the jackdaws they make an almighty clatter. In the morning as they head off for the day’s foraging for food, they also make a lot of noise. Undoubtedly they communicate with each other. Often, when I throw out crumbs to feed the sparrows, a rook lands nearby, cawing loudly to his companions to call them to the easy pickings. Rooks are, entirely black with a dark blue metallic sheen. They have a greyish/ white base to their strong bill. Rooks can pair for life and often stay together all year round. Rooks are a symbol of a long settled life (they can live up to twenty years). In weather lore, it was held that rooks, feeding in a village field, or close to their nests meant bad weather was on the way. Rooks flying far from their nest meant good weather was on the way. The building of a new rookery, near a house was regarded as good fortune. Consequently, if a rookery near your home was abandoned, it was a bad omen, known as ‘the curse of the crows’. The collective name for a flock of rooks is a ‘parliament’ or also a ‘murder’ or ‘clamour’. The collective name ‘parliament’ is very appropriate as they certainly ‘debate’ a lot. 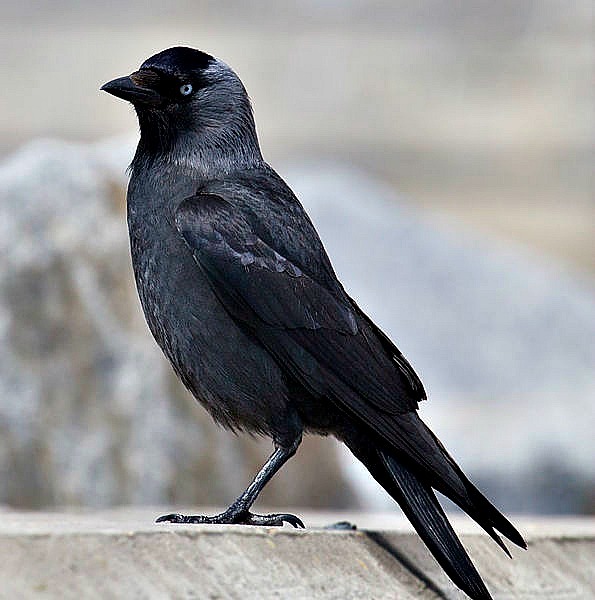 The jackdaw is the smallest member of the crow family Very intelligent, they are black in colour but have a distinctive grey scarf around the throat and nape of the neck. They are social birds with a recognised leader and pecking order. In the Middle Ages, they were known as ‘daws’ until the familiar name Jack was added. Their habit of nesting in chimneys and their reputation for taking shiny objects has brought them into close proximity with humans. They are generally regarded as likeable rogues. Their scientific name is Corvus monedula spermologus; in Irish, Cág. It was said that if jackdaws did not frequent a ruined castle or tower then it was surely haunted. The arrival of a solitary jackdaw was taken as a portent of some approaching calamity Also, a jackdaw falling down the chimney was a portent of bad luck. In the old days they frequently built their nests in chimneys of houses. This was a nuisance as at that time the kitchen fire had to be lit even in summer for cooking and boiling water. Today most houses have a ‘cap’ to prevent them building there.